Kasa Smart's power strip allows you to individually control 6 smart outlets, anytime, anywhere. 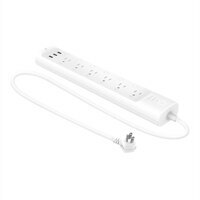 The ETL certified power strip also includes 3 USB ports. No more fighting over charging stations! Kasa Smart's power strip monitors how much energy devices consume and protects them from sudden power surges that occur during weather storms, such as lightning and rain. The smart power strip has a slender and low-profile design that fits behind furniture and in tight spaces with no damage to the cord or the furniture. Its right-angled plug creates room for the other in-wall outlet to be used.